Mariano Anderle, a longtime friend to ISR, was recently in town to explore expanding research connections with the University of Maryland as part of his new position as a science attaché for the Autonomous Province of Trento in Italy. Anderle is working on special projects that will increase the number of Trento's international research agreements as the province moves forward with high quality education, research and innovation. In his position, Anderle coordinates international agreements for three entities: the University of Trento; the Fondazione Bruno Kessler (FBK), which studies information technology, materials and microsystems among other disciplines; and the Fondazione Edmund Mach (FEM), dedicated to cultural and socio-economic growth in the agricultural, forestry and agro-alimentary sectors. 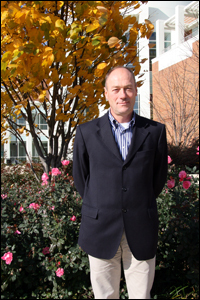 Anderle worked with ISR as a visiting researcher in 2003, 2005, 2006, 2007, and 2008. He has partnered in research with Professor Gary Rubloff (MSE/ISR) and ISR Director Reza Ghodssi (ECE/ISR), as well as with nano-bio-medical collaborators from other parts of the University of Maryland system. Anderle and ISR hope to continue partnerships and expand the international collaboration opportunities between the Province of Trento and the University of Maryland. Prior to his current appointment, Anderle was chair of the Division of Surface Science at FBK.